Sony Pictures Home Entertainment has kindly sent me a bundle of interesting catalogue titles on Blu-ray. 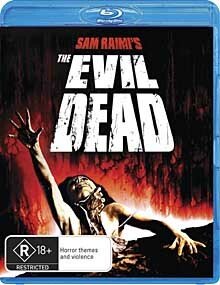 The first one I ran through the BDInfo MRI Scanner was The Evil Dead which, weirdly, I have never seen. I’ve been meaning to for ages, since it was the first from Sam (Spider Man) Raimi, and it scores an impressive 7.6 on IMDB. Amongst the extras are a BonusView PIP stream which shows other horror movie makers discussing it, a 54 minute doco, 59 minutes of raw unused footage and five featurettes amounting to about 36 minutes run time. What’s interesting is that two of these featurettes are apparently not accessible from the disc menus! The longer one is a panel discussion at a 2001 American Cinematheque showing of the movie, which runs for 7:17, while the other is a reminiscence from Raimi’s, Bruce Campbell’s and certain others’ high school teacher (3:59). If your computer is capable of playing past the Blu-ray restrictions, you can drag the relevant *.m2ts files (00008.m2ts & 00009.m2ts) from the disc’s ‘BDMV/STREAM’ folder into a player and watch them that way. So why are they there? And why not accessible from the menu? Was this just an oversight? I suspect the latter. The back of the disc box proclaims ‘Over 2.5 hours of spine tingling special features’. But the stuff accessible via the menu comes to only 2.3 hours. The missing bits would push it over the line. See, even without watching the movie Blu-ray can keep you entertained!